Facing a fierce public backlash over privacy issues, Facebook worked to reverse its tarnished image Wednesday, offering three big changes to how users can manage their privacy. At a press event, Facebook CEO Mark Zuckerberg said that his company would "simplify" privacy controls starting with a redesigned privacy settings page. "We've focused on three things: a single control for your content, more powerful controls for your basic information and an easy control to turn off all applications," he wrote on the official Facebook blog. These new controls, outlined below, will be rolled out to users starting today, but will take possibly weeks for all users to see them, according to Zuckerberg. The image below is Facebook's revamped privacy settings page that the company says will help people take control over how they share their personal information. Facebook is introducing a new privacy settings page to allow you, as a user, to more easily control who sees the content you post. Using this settings page that Zuckerberg calls "one simple control," you'll be able to set the content you create on your Facebook page to either everyone, friends of your friends, or just your friends. Sharing of your content will also apply to Facebook products launched in the future -- eliminating the need to set new rules for different types of new content, services, or features that are introduced at a later date. The second privacy update outlined today is one that gives users a better handle on what basic information you share with the larger Facebook community. One big difference: You'll be able to block people from seeing your Facebook page and your friends' pages. 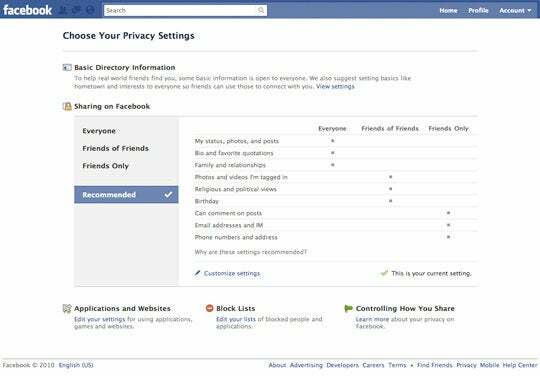 However, Zuckerberg points out: "We recommend that you make these settings open to everyone. Otherwise, people you know may not be able to find you and that will make the site less useful for you." These controls will be accessible via a Basic Directory Information in the privacy page settings area. Facebook says it is also making it easier for you to close off access from third-party applications (such as games) and Websites to your private information. Zuckerberg said that Facebook has added "an easy way to turn off Platform completely. This will make sure that none of your information is shared with applications or websites." Controls over third-party access to your private information also extends to Facebook's controversial "Instant Personalization" option. "Already, partner sites can only see things you've made visible to everyone. But if you want to prevent them from even seeing that, you can now easily turn off instant personalization completely," Zuckerberg said. Zuckerberg assures that these privacy changes are here to stay. "If you find these changes helpful, then we plan to keep this privacy framework for a long time. That means you won't need to worry about changes. (Believe me, we're probably happier about this than you are. )," Zuckerberg said. As much as these changes put more privacy controls into the hands of users, it's hard to say if it will quiet privacy activists and angry Facebook users. Many have asked that Facebook require users to opt-in to data sharing relationships as opposed to opting-out.